In this type of Racing the act of Formula Offroad Water Skipping or Hydroplaning has been a part of competition for a long time. It all started in Iceland way back in the day. Formula Offroad has since spread to other Scandinavian Countries such as Finland and Norway. Hydroplaning is a great test of horsepower and speed. It also tests the driver and crews skill level. You have to build a fast machine as well as know when to hammer down and when to peddle it. We have seen these crazy drivers attempt to walk on water in Iceland on a short course. This time they came to the USA to show us all how it is done on one of the longest hydroplane courses we have ever seen. This time Formula Offroad Racing cars drive across a thousand foot water crossing during a race in the USA. This was the first ever Formula Off Road USA event and it took place at Bikini Bottoms Off Road Park in Dyersburg, TN. The high power to weight ratio helps their cars Walk on Water thanks in part to their wide paddle tires. This shallow lake was built solely for this purpose by the crazy folks at the park. Only the top cars were able to make it all the way out the end of the course on top of the water. Many of the cars got in too deep and had to be pulled out by a tractor. 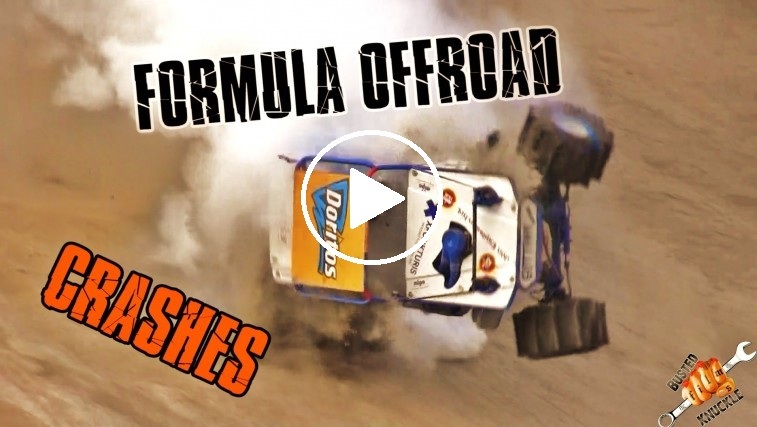 This wide open motorsports mayhem that is Formula Offroad Water Skimming is really one of our favorites to watch and video. The drivers have to waterproof their cars so they can stay running in these extreme conditions. This also helps when they are slinging sand and volcanic ash. Elements commonly found on the amazing hill climbs they attempt to conquer any given weekend in Iceland and Norway. For more hill climb videos check out the links below. Also be sure to head over to the Busted Knuckle Store to get some merchandise.